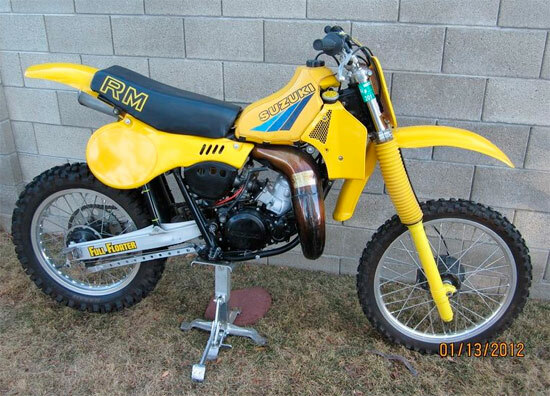 Nice, clean, 1982 Suzuki RM250 up for auction. The early RM’s were known for the best rear suspension ever produced and the ’82 RM250 for the fastest motor of it’s time. This one has been restored with new plastic, seat cover, freshly built top end, new crank seal, DG pipe & silencer, ’83 43mm. forks, Maxxis tires, aftermarket brake arm, ’83 tank cover, etc. Bike has no leaks, wheels are straight, suspension and brakes work as they should. A little cold blooded on start up, but nothing terrible. A bike you can take to the starting line and race. Bike is jetted correctly for 5000′ elevation. Nothing to hide here. If you have any questions feel free to ask. Bike is registered in my name for the state of Utah. Utah does not issue titles for vehicles this old. Registration is proof of ownership and will provide a Bill of Sale to the new owner. If the bike need’s to be shipped, I will crate and bring to a terminal for the cost of material and my time if needed. I’ve had good luck with Uship.com as well.